Eisner Award-winners Matt Fraction, Gabriel Bá, and Fábio Moon team up with Pulitzer Prize-winning author Michael Chabon for an all-new Casanova Quinn story in CASANOVA: ACEDIA #1, coming to Image Comics on January 7. The idea came up at the end of a podcast with the two writers when Chabon mentioned a desire to write Casanova backups in the spirit of Stan Lee and Jack Kirby’s classic "Tales of Asgard" strip. Produced for the back pages of The Mighty Thor, these stories introduced young Marvel Comics readers to classic Norse lore. 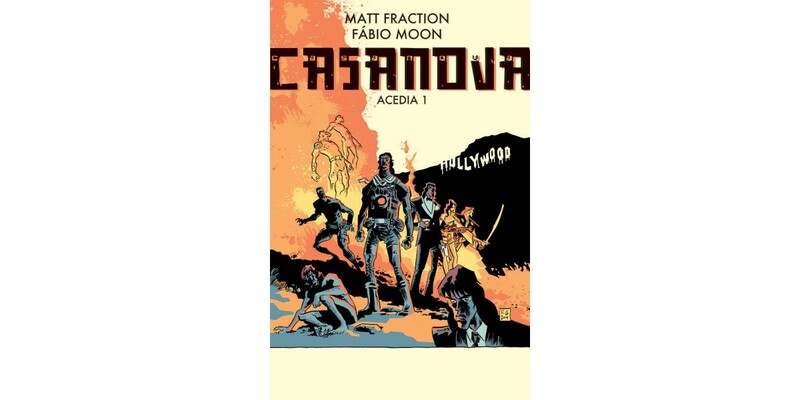 CASANOVA tells the story of a hedonistic thief turned kind-of spy as he navigates the incredibly complex and stunningly psychedelic parallel world of interdimensional global espionage. CASANOVA: ACEDIA #1 (Diamond Code NOV140529) arrives in stores this 1/7 and will be available for $3.99.